In February of 2018, fellow artist Larry Ellingson and I engaged in a non-stop conversation in a car, hurtling through space from the east side to the west side of Washington State, and back. Conversing wildly and led by shared interests topics ranged across brain/mind science, astronomy, history, materials, construction, and art and science in general. 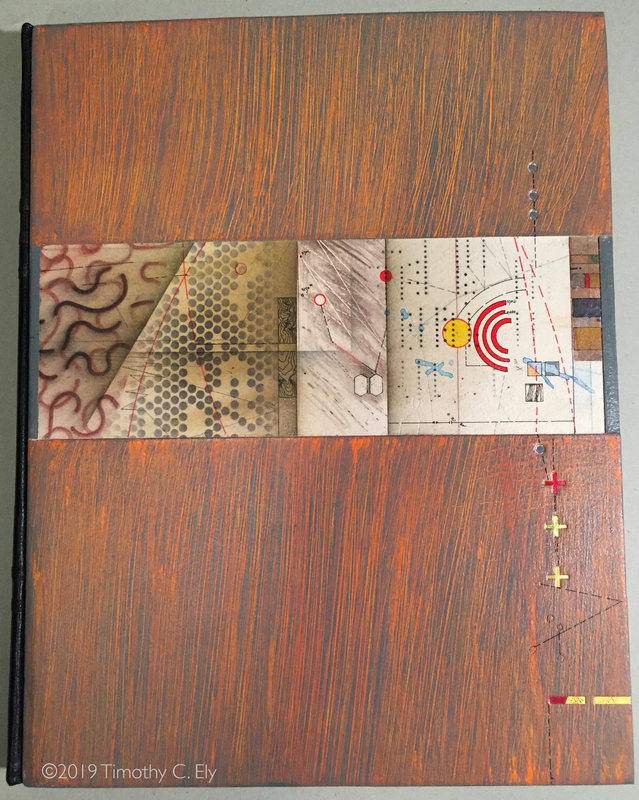 At the end of the road trip a collaboration had taken shape: I would draw/fabricate/compose six graphic scores bound into a one-of-a-kind manuscript book and Larry would create music worked from those graphic scores. Over the years I have made books about time and dust and flying machines and submarines; books on color and other phenomena from the world of natural philosophy. It was now time to make music. At the outset, I established a few rules for myself, primarily that the drawings would be about six minutes in length as you move left to right across the page — the idea of time in a drawing! I began to look for visual concepts containing both contrast and overlap, giving the compositions an album-like continuity and connective tissue, as well as interesting and evocative ideas to ground the potential sound. 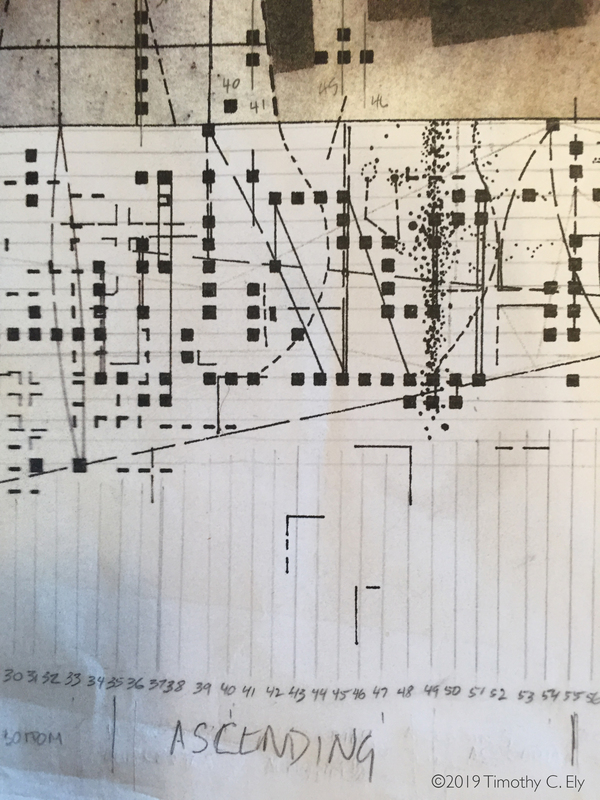 The resulting music Larry pulled out of these drawings is extraordinary, adding unexpected layers to the experience of my drawings. Our process was uncomplicated: I created drawings and turned them over to Larry. He created the music and we brought the two together. It was not a process of drawing in response to sound – but creating sounds in response to image. In the second installment of this post, you will see some details of Larry’s notes on the working drawings he had. The notes are also in the Lilly collection. Using both found and synthesized sound, Ellingson composed music that realized the visual compositions I created. Reflecting the nature of my drawings, the compositions are dense and intricate soundscapes. This was one of the most interesting musical projects I have done. Translating images into sound and music comes from a centuries old practice that came into its own in the 1950s and 60s avant garde art community. The process has taken me into areas I have always wanted to explore, using both familiar technology and altogether new tools, creating music I have never heard before. When Tim finished the pages for the book, SCORE, he gave them to me to realize with no instructions. No rules. As a sound artist and composer myself, the rest was up to me. A hundred other sound artists would have created a hundred entirely different soundscapes. Sonic realizations are directly analogous to the visual — more literal than abstract. “Hearts” of scores are read in time: left-to-right, first-to-last; in pitch: upper-to-lower, treble-to-bass, with few exceptions. Aural interpretations are sometimes specific: object=sound. Frequently, visual groupings or patterns translate to sonic events, melodies, harmonic motion, ensembles, textures, etc. Many visual elements are not addressed. Assumption #1 is occasionally ignored. Notes from Larry’s work interpreting an image. Larry and I are both very happy with the work and saw verification of our efforts in audience response when we previewed the work in December. As we continue to debrief and bring the final threads together, we reflect on the vitality of the collaboration and how much we have learned from each other. Thanks always to the Lilly Library, Bloomington Indiana, The Kolva-Sullivan Gallery, Spokane and to Ann Marra and Jan Wigen for keeping us honest. We stand on a large pyramid of people, most of whom we will never meet—the software developers for the technology used for the music, the producers of materials for bookmaking, our many, many teachers and mentors, and those who taught our teachers and mentors, and so it goes. Much gratitude. My next blog post will tour the book — discussing of each of the 6 works in the book and on the CD. The Lilly encourages the general public to access their rare book room where they can view this work (along with my previous work in their collection). And to help others see SCORE we are offering for sale an open edition of each folio/drawing. We also offer a CD of the music. The booklet contained in the case holding the CD will hint at the structure of the book. If anyone is interested in obtaining editions of the drawings or the CD, use the contact form on the “Collecting My Work” page of this blog to reach us. Timothy C. Ely has been working as a visual artist since the late 1960s. He received an MFA in Design from the University of Washington in 1975 and since that time has been making one-of-a-kind manuscript books housed in public and private collections worldwide. He lives in Colfax, Washington and is represented by Lux Mentis, Portland, Maine. Larry Ellingson makes highly compelling objects, a kind of additive sculpture, combining assemblage, painting, photography and fabrication. He is also a sound artist, composing, performing and producing music utilizing electronics and found sound. He lives in Spokane, Washington. Thank you. It is now correct… (This is Doug. I edit for Tim).